English theoretical physicist known for his work in quantum mechanics and for his theory of the spinning electron. In 1933 he shared the Nobel Prize for Physics with the Austrian physicist Erwin Schrödinger. Quoted in Frank Wilczek, ',The Dirac Equation'. Proceedings of the Dirac Centennial Symposium (2003), 45. 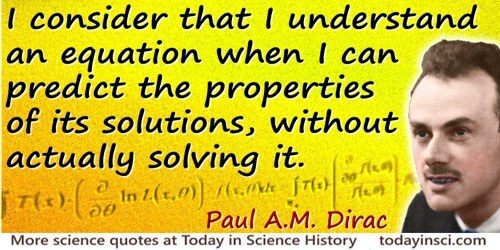 I consider that I understand an equation when I can predict the properties of its solutions, without actually solving it. Quoted in F Wilczek, B Devine, Longing for the Harmonies. I think it is a peculiarity of myself that I like to play about with equations, just looking for beautiful mathematical relations which maybe don’t have any physical meaning at all. Sometimes they do. "Interview with T. Kuhn (7 May 1963), Niels Bohr Library, American Intitute of Physics, New York. In A. Pais, 'Playing With Equations, the Dirac Way'. Behram N. Kursunoglu (Ed.) and Eugene Paul Wigner (Ed. ), Paul Adrien Maurice Dirac: Reminiscences about a Great Physicist (1990), 109. It is more important to have beauty in one's equations than to have them fit experiment... It seems that if one is working from the point of view of getting beauty in one's equations, and if one has really a sound insight, one is on a sure line of progress. If there is not complete agreement between the results of one's work and experiment, one should not allow oneself to be too discouraged, because the discrepancy may well be due to minor features that are not properly taken into account and that will get cleared up with further developments of the theory. In 'The Evolution of the Physicist’s Picture of Nature', Scientific American, May 1963, 208, 47. Just by studying mathematics we can hope to make a guess at the kind of mathematics that will come into the physics of the future ... If someone can hit on the right lines along which to make this development, it m may lead to a future advance in which people will first discover the equations and then, after examining them, gradually learn how to apply the ... My own belief is that this is a more likely line of progress than trying to guess at physical pictures. 'The Evolution of the Physicist's Picture of Nature', Scientific American, May 1963, 208, 47. In Steve Adams, Frontiers (2000), 57. People were pretty well spellbound by what Bohr said… While I was very much impressed by [him], his arguments were mainly of a qualitative nature, and I was not able to really pinpoint the facts behind them. What I wanted was statements which could be expressed in terms of equations, and Bohr's work very seldom provided such statements. I am really not sure how much later my work was influenced by these lectures of Bohr's... He certainly did not have a direct influence because he did not stimulate one to think of new equations. Recalling the occasion in May 1925 (a year before receiving his Ph.D.) when he met Niels Bohr who was in Cambridge to give a talk on the fundamental difficulties of the quantum theory. In History of Twentieth Century Physics (1977), 109. In A. Pais, 'Playing With Equations, the Dirac Way'. Behram N. Kursunoglu (Ed.) and Eugene Paul Wigner (Ed. 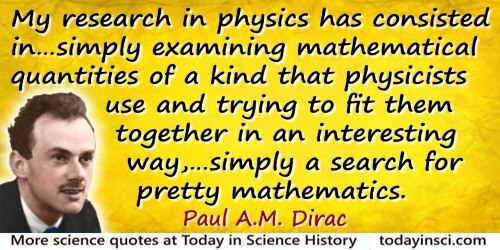 ), Paul Adrien Maurice Dirac: Reminiscences about a Great Physicist (1990), 94. 'Quantum Mechanics of Many-Electron Systems', Proceedings of the Royal Society (1929), A, 123, 714-733. Quoted in Steven M. Bachrach, Computational Organic Chemistry, Preface, xiii. The trend of mathematics and physics towards unification provides the physicist with a powerful new method of research into the foundations of his subject. … The method is to begin by choosing that branch of mathematics which one thinks will form the basis of the new theory. One should be influenced very much in this choice by considerations of mathematical beauty. It would probably be a good thing also to give a preference to those branches of mathematics that have an interesting group of transformations underlying them, since transformations play an important role in modern physical theory, both relativity and quantum theory seeming to show that transformations are of more fundamental importance than equations. 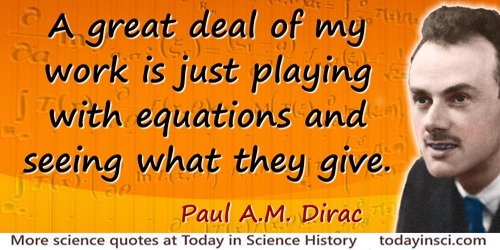 8 Aug - short biography, births, deaths and events on date of Dirac's birth. The Strangest Man: The Hidden Life of Paul Dirac, Mystic of the Atom, by Graham Farmelo. - book suggestion.